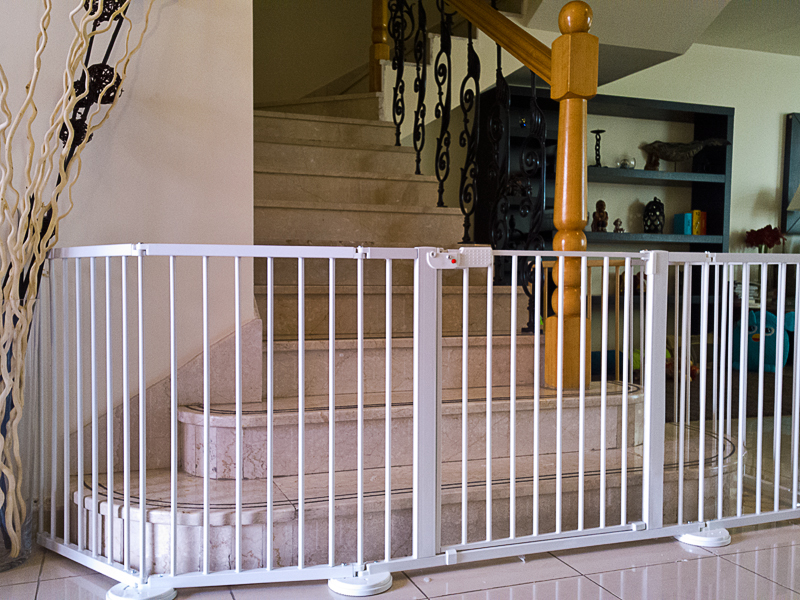 Probably the most common first requirement by parents who call us is to install safety gates on the stairs. 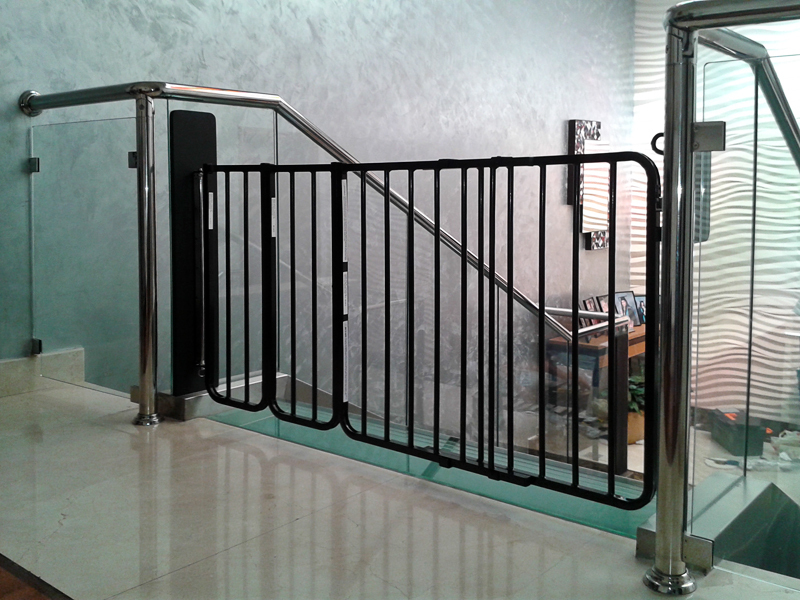 Here in the UAE there are some large and awkward staircases to deal with – staircases with low walls jutting out, recesses, railings, glass walls, and staircases that spread out grandly at the bottom but with no supports at all on the sides. 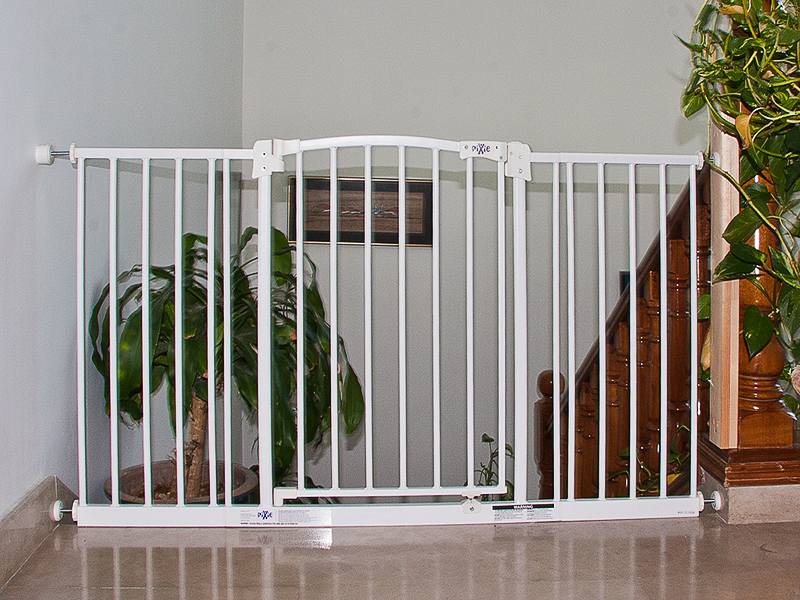 These features make it difficult to install gates simply and safely. 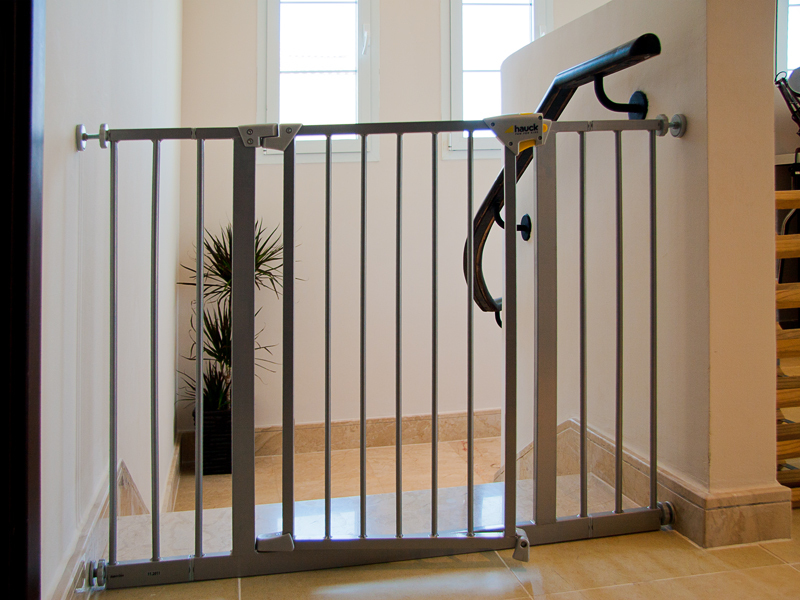 We are familiar with all types and we can offer a range of gates and solutions for them all. 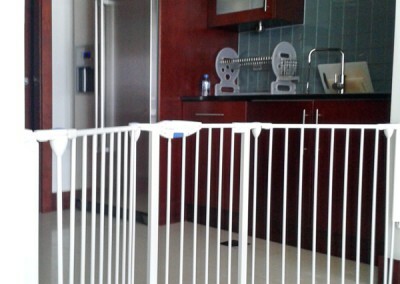 Pressure gates are fixed in place using pressure. 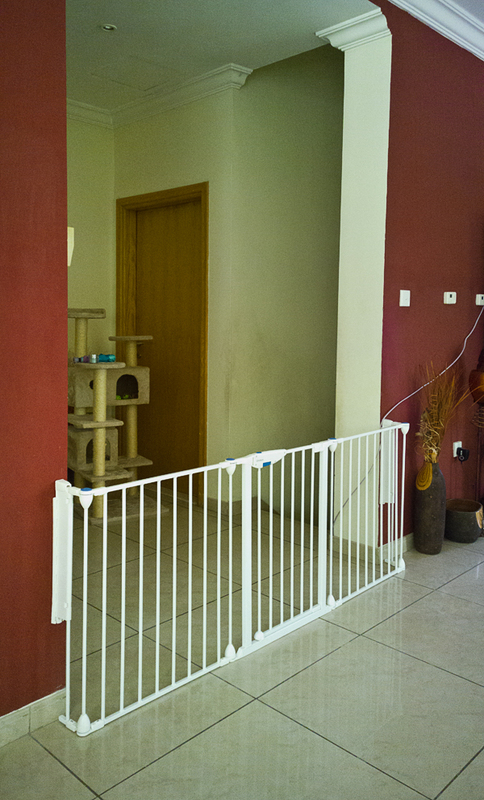 You do not need a drill to install a pressure gate. 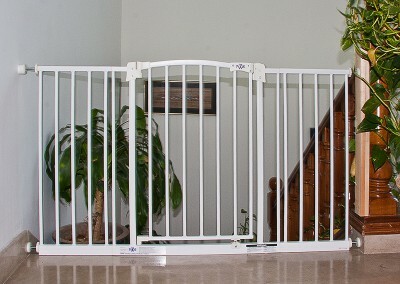 Pressure gates have 4 ‘feet’ – one on each corner, top and bottom. 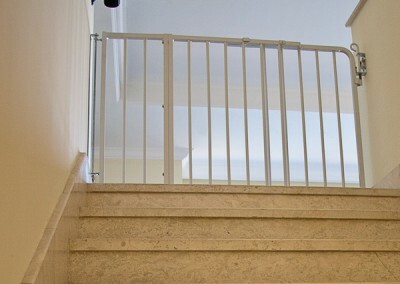 The feet have small hand wheels. 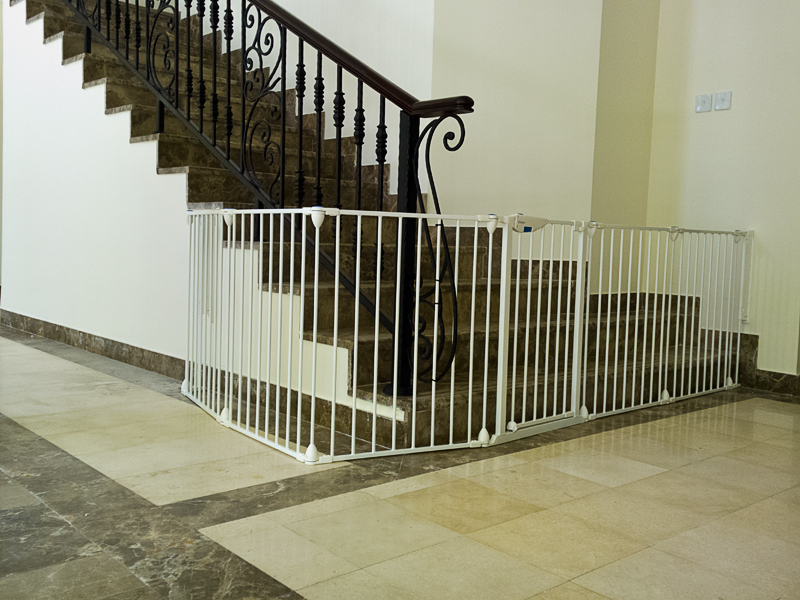 Twist the little wheels to increase or decrease the pressure into the walls or door posts. 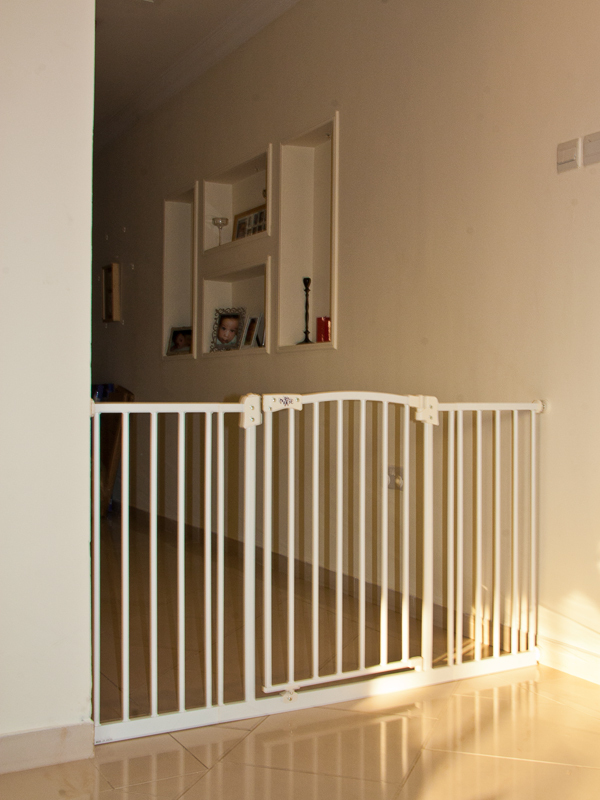 Before fitting the gate, you need to install four small holding cups on the walls and skirting board first. 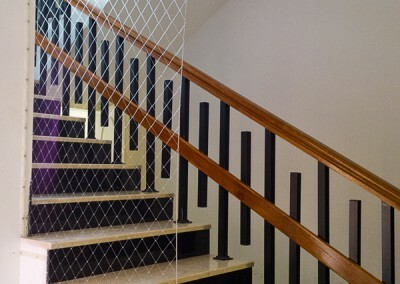 These can be attached using double-sided adhesive pads, or screwed into the wall if preferred. 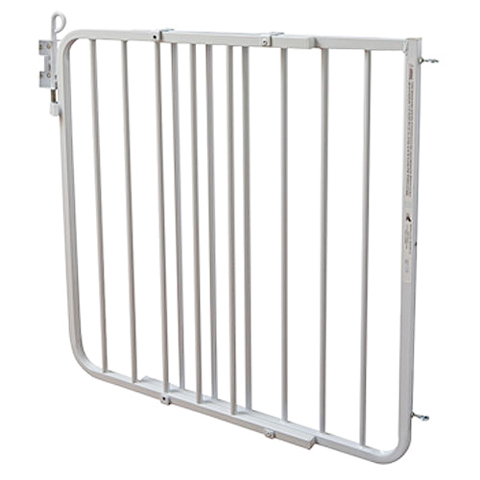 The gates are suitable up to about 80 cm width, but extensions can increase this to between 110 cm and 140 cm depending on the brand. 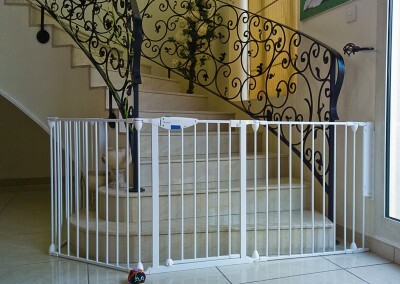 On the plus side, pressure gates are usually cheaper than hard-fix gates. 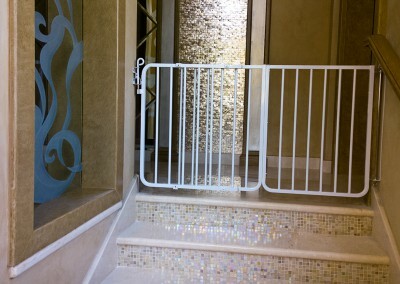 But take into account the price of extensions. 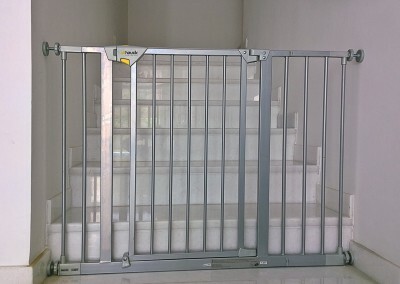 On the down side, pressure gates have a bar at floor level, across the whole width. 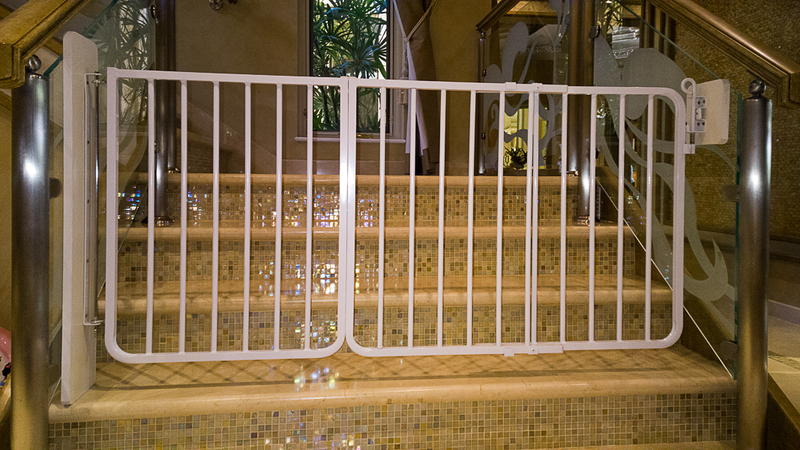 This can be a tripping hazard. 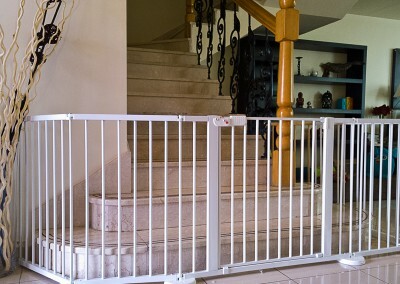 Most safety authorities do not recommend pressure gates to be installed at the top of the stairs. 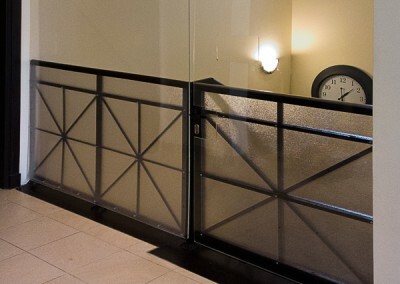 Hard-fix gates are fixed in place by drilling into the wall and using screws. 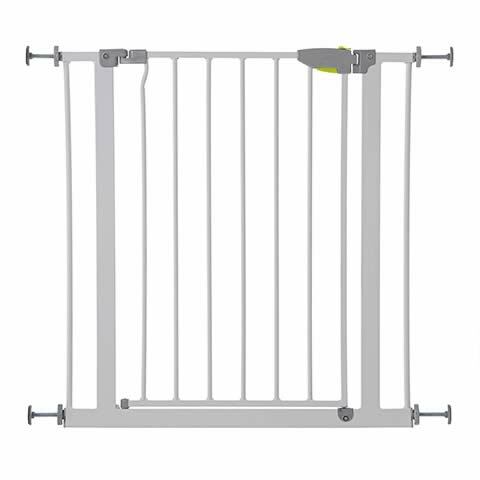 The gates can be suitable up to about 100 cm width, depending on the brand, but extensions can increase this to 150 cm or more. 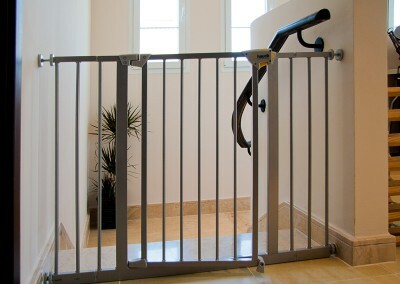 Hard-fix gates are usually more expensive than pressure gates, and also check the price of extensions. 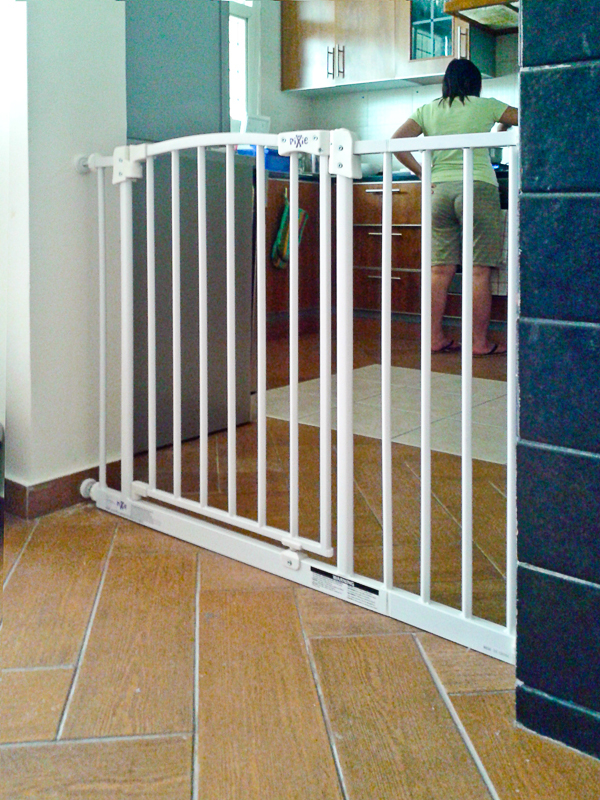 Hard-fix gates require drilling. 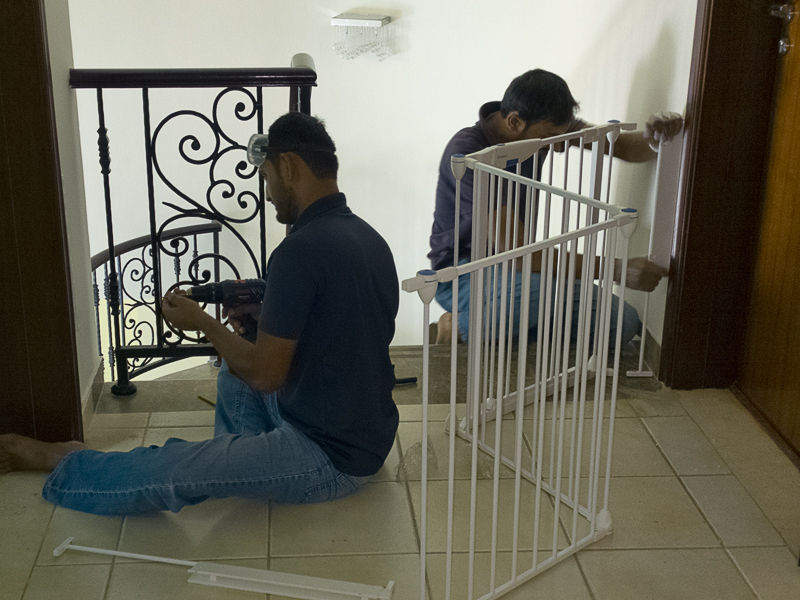 Don’t always trust the supplied screws and plugs. They might not be long enough. 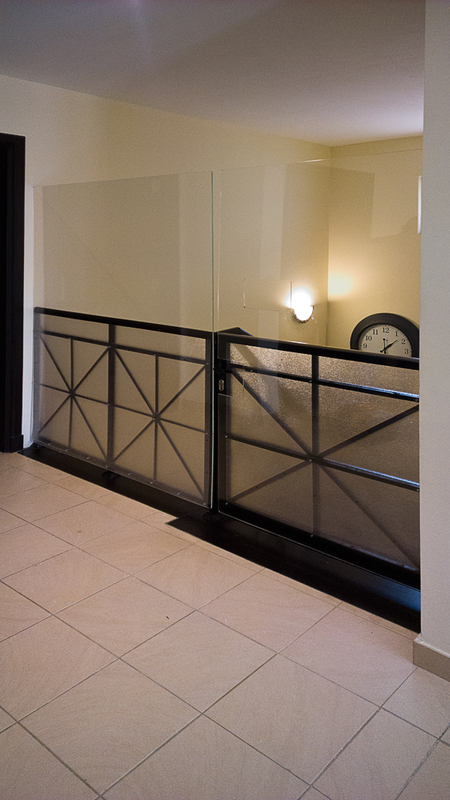 In our experience, many walls in newer developments are of poor quality and crumble away easily! 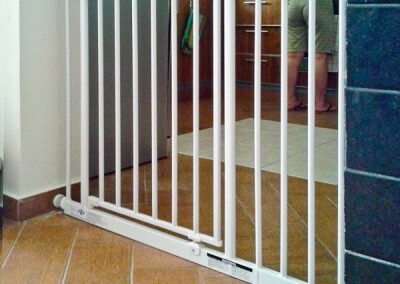 Hard-fix gates do not have a bar at floor level. 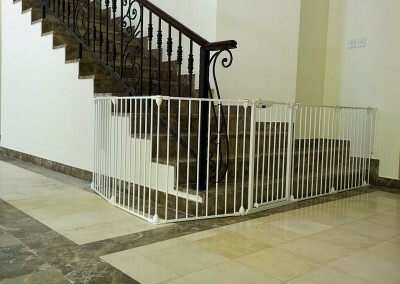 These gates are recommended for the top of the stairs. 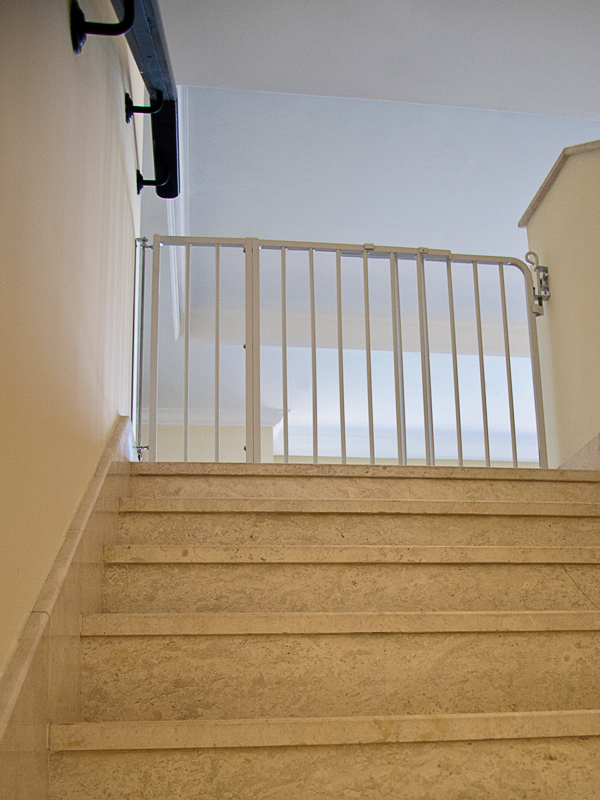 On the subject of stairs, another major hazard for kids is the gallery railings area around the top of the stairs. 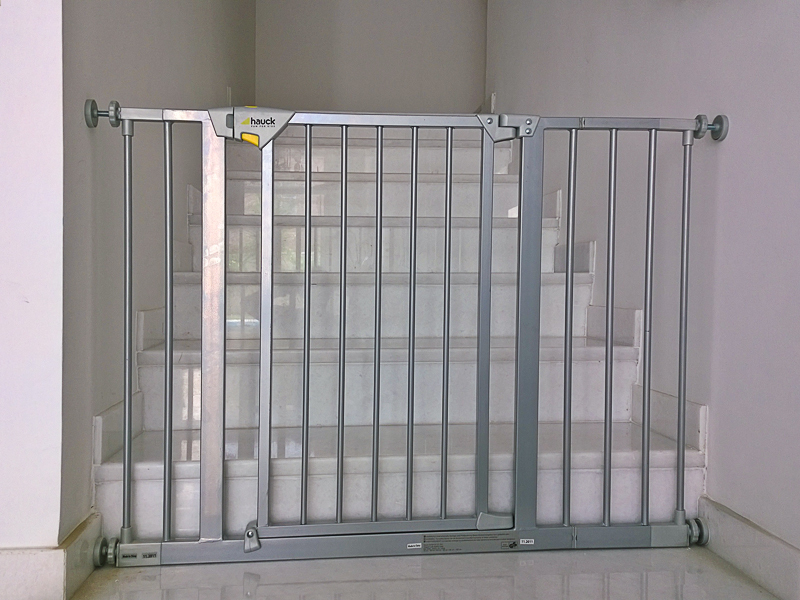 Especially as this is often used as a play area. 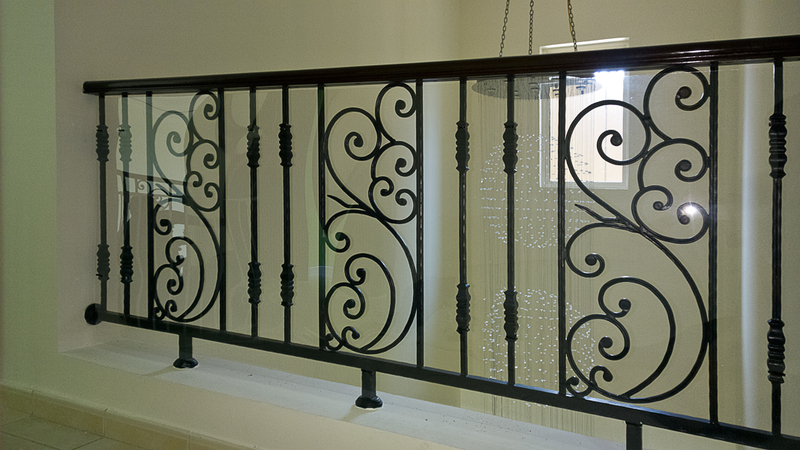 If your railings area consists of ornate scrollwork, check for large open areas and also for protruding pointed features. 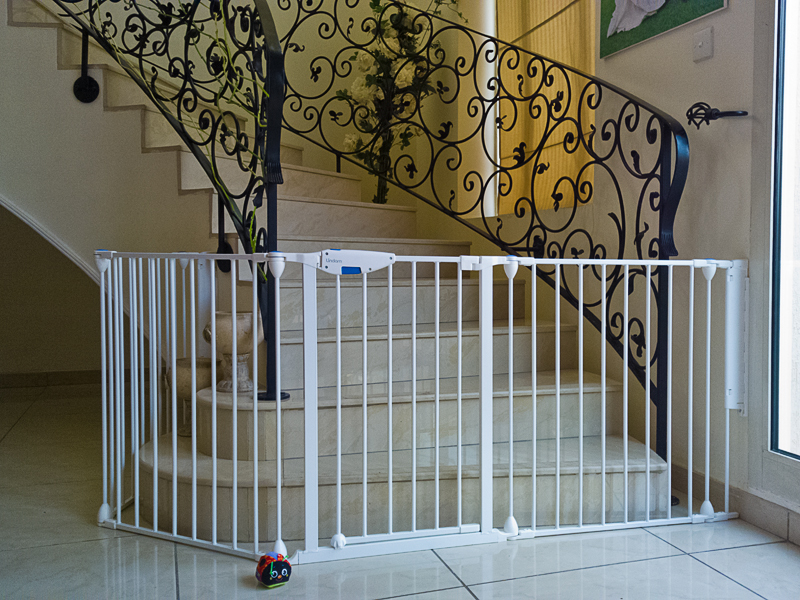 One of the worst design gaffes, from a child safety point of view, is horizontal rails – i.e. 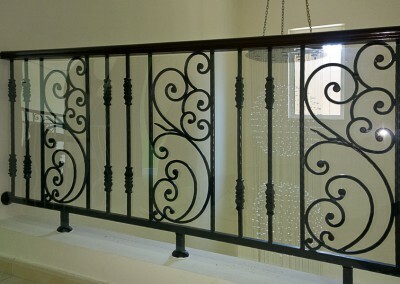 railings that are like step ladders or climbing frames! 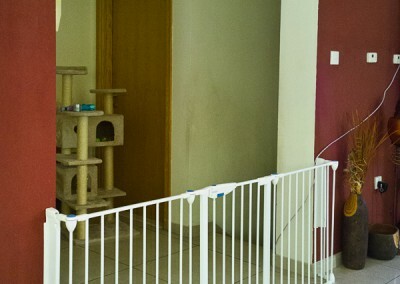 …check you have no furniture or climbable objects nearby. 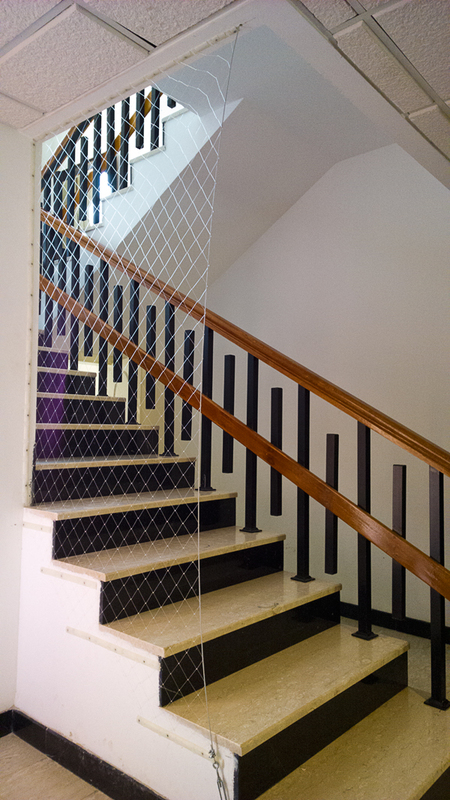 We recommend plexiglass shielding or Netzen safety netting depending on the peculiarities of the site. 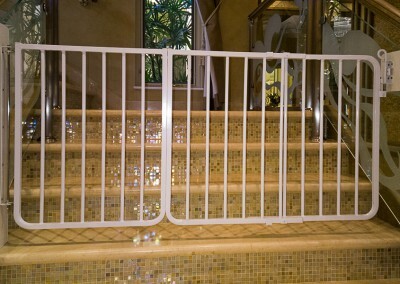 These can both be used to secure gaps in the railings, and also to increase the height of railings or walls. 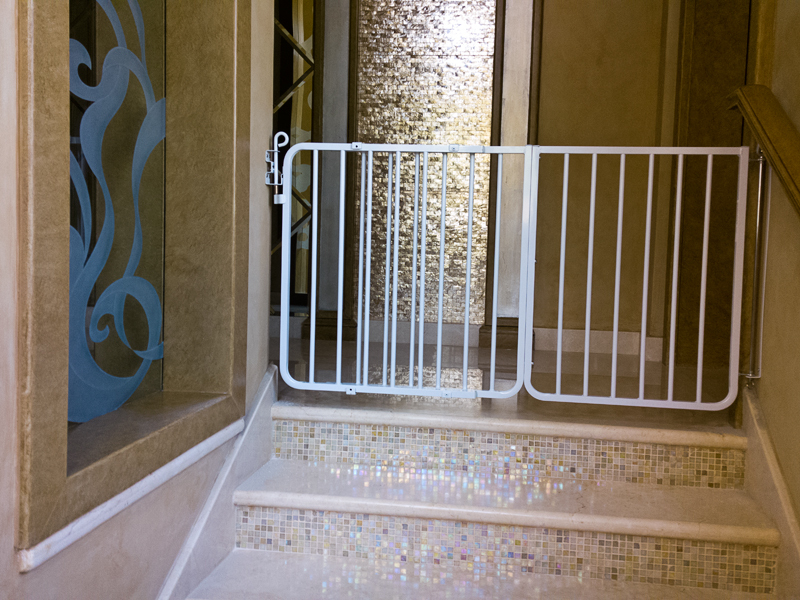 Safety gate top of stairs – Dubai Palm Jumeirah. 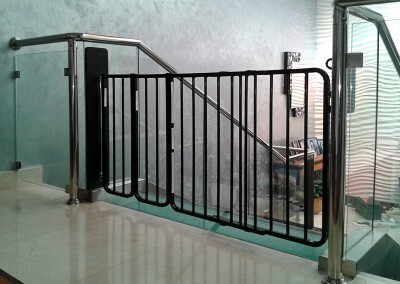 Safety gate on wide stairs – Emirates Hills.